Dwight D. Eisenhower Junior High School part of SD54 in Hoffman Estates held their first ever McTeacher’s Night at the Hoffman Estates McDonald’s on Higgins Road on Wednesday, February 1. 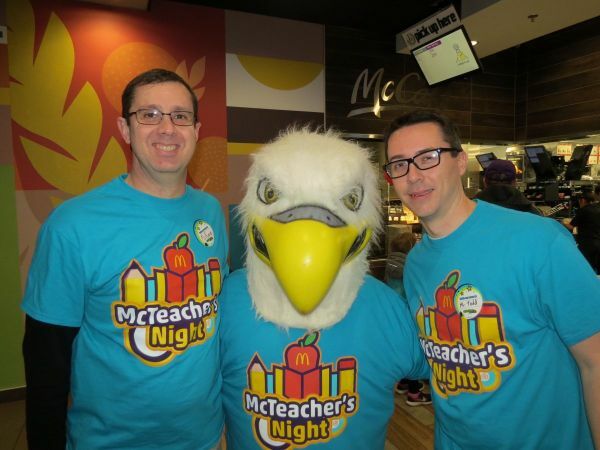 A McTeacher’s Night is organized to help raise money for local schools by having teachers work at McDonald’s and then giving a percentage of the night’s sales to the local school. On Wednesday the restaurant was taken over by teachers excited to serve freshly prepared meals to students and their famiies to raise money for Eisenhower Junior High. The students and families were excited to see their teachers and principals behind the counter and throughout the restaurant. Sixteen teachers worked from the junior high, including Principal Steve Kern and Assistant Principal Brandon Todd. The McTeacher’s jobs included greeting guests, cleaning the lobby, working the front counter, serving drinks, clearing tables, selling pies and even dressing up in a pie costume–all duties which were executed with great enthusiasm. Also at the event was Eddie The Eagle, the school’s mascot. Eddie posed for pictures with students and welcomed students to McDonald’s. Antonio Diaz, bilingual teacher, wore the pie costume for the entire event. He enjoyed telling pie jokes to the junior high students. A special thank you goes to PTA Second Vice President, Shonda Dudlicek who organized the event as well as everyone that worked and attended the event. Eisenhower teachers worked hard and with excitement, while the families enjoyed a spectacular evening. The Eisenhower PTA plans to use the money raised for t-shirts for all the students, PBIS programs, diploma covers for the graduates and end of year field trips. The PTA raised $779.00 at the event thanks to all the singing the teachers did for tips. The students donated money to have the teachers sing the McDonald’s jingle over and over!